Grabstein von Julius Oestreich in Babenhausen. 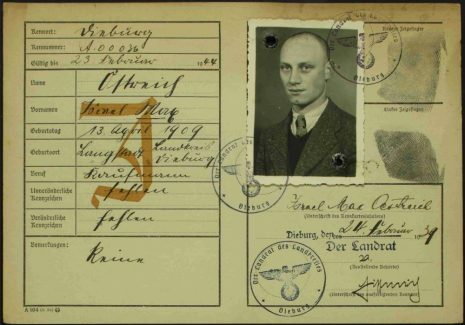 Julius Oestreich kam am 28. Februar 1876 in Langstadt/Babenhausen als Sohn von Nehm „Nathan“ Oestreich und Guthal Steiermann zur Welt. Er war Viehhändler wie sein Vater. Die Oestreichs waren zu der Zeit eine von vier jüdischen Familien unter 700 Einwohnern. 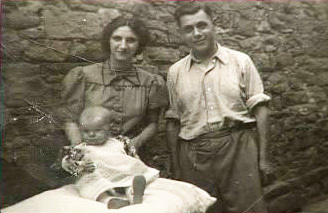 Julius heiratete Sara Adler, geboren am 22. Mai 1882 in Hintersteinau, Main-Kinzig-Kreis. Before the First World War there was no electricity or water in the houses. I lived twenty metres from the well where we pumped our water. In those days if someone needed water they took two pails to the well, filled them up and carried them back to their home. There was always clean water in the well. Each family had a big house with plenty of room. We had a cooking oven in the kitchen and an oven for heating in the living room, both of which burned wood. Every year the [mayor] of the village would organise the cutting of the trees for fuel. These trees belonged to the village and after the trees were cut down the forest was replanted. 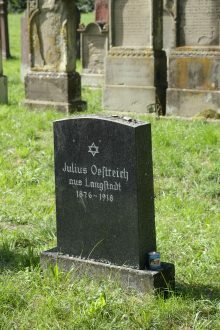 Julius Oestreich mit seinem Sohn Max. Every family had animals; chickens, cows and geese. Very few families had horses, except for the big farms, which needed the horses to work their large fields. The small farmers put cows to the plough and goods were brought from the fields by wagon pulled by cows. Every family had fields where they grew everything they needed, such as corn, potatoes, wheat and food for the animals. We baked our own bread. Whenever we needed help to work in the fields we asked one of the farmers. We waited for rain, as there was no other way of watering the fields. I went to the school in the village. Although the children, generally, didn’t work, sometimes the farmers found work for us to do. We could take the animals on the plough and walk them up and down. 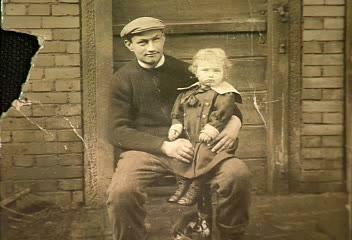 In 1918 my father succumbed to the influenza epidemic. After father passed away my mother, my sister and I were alone, so it was arranged for someone to help us in the fields. I remember the day the First World War started. It was Shabbat and we were taking a walk in the fields. There was a declaration that the War had started. As we passed City Hall, we saw, posted outside, the notice announcing the War. I remember that someone had been killed and that had precipitated the outbreak of fighting. We were prepared for it. The younger boys were called up for service into the army. As children we enjoyed watching the soldiers march through our village as they went from place to place. The soldiers were kind to us. In those days nothing was motorised, horses pulled everything. Because my father was a cattle dealer, we had a big stable where we were able to stable the horses for the soldiers. When the army came through the villages they brought everything with them. They carried their own food and also food for the horses. They had their own kitchen, which was a big cauldron, on a wagon pulled by horses. They stayed only two days before they moved on. Although the soldiers had tents, some of them slept in the houses. The large houses of the farmers had plenty of room to accommodate the soldiers. We were always happy to see them. the treifeh butcher to sell. We had a nice life and were very happy. G-d gave us sunshine and he gave us rain. No one bothered us and the goyim respected us and the way we lived. Stolpersteine for Betty, Judis and Jossy in Frankfurt. Betty and Sally Aumann lived at Bornwiesenweg 34. Betty and Sally Aumann with their daughter Judis. Max‘ Schwester Betty Aumann und ihre Familie wurde von Frankfurt aus deportiert. We had a shul where originally, at the end of the 1800’s, there were 25 members. As the young people gradually moved away there appeared to be no future in the village. By the beginning of the twentieth century the world had changed. It was the same situation in the next village, a forty-minute walk away. In order to have a minyan for Shabbos every week, one Shabbos we went there, the next Shabbos they came to us. On Rosh Hashanah we had our own minyan because the young people, who had their own businesses in the next town, came home. Usually they were apprentices in the textile stores where people bought all their necessities. My mother’s brother and his wife had no children and lived in a different town, which had a better school. In order to attend that school I went to live with them and slept away from home. my samples together and walked out. We went home anyway and the Police came and took us in. They put us in jail that night and the next day we were sent to Buchenwald. At that time if you had papers that you had applied to emigrate you were released. 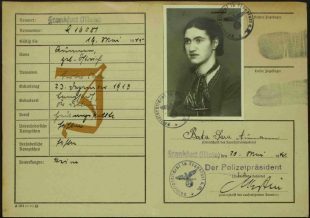 We had applied to emigrate to America and my wife went to the main offices of the Gestapo to show them our application papers. Although I was released after exactly four weeks, it was some time before we were able to set sail to America. In our village we had a [mayor] who was ’a piece of gold’ and not a Nazi. In the village there were two other Jewish fellows. After I was released from Buchenwald in 1938, the [mayor] gave the three of us a jobs cutting down trees in the woods, so that we could make a living. In 1939 my wife and I left for Frankfurt. The Jewish organisation that we were registered with sent us a letter that we had should go from there to Berlin where we were to join a group going to Lisbon. From Lisbon we set sail to America. Max und seine Frau lebten zunächst in New York und folgten später ihrer Tochter nach Petach Tikvah, Israel. Max starb am 6. November 2009 in Israel. Seine Schwester Betty hatte am 14. März 1939 in Frankfurt Sally Aumann aus Eisenbach/Selters geheiratet. 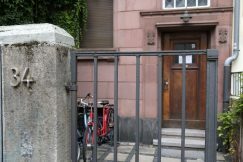 Sie lebten am Bornwiesenweg 34 wurden aber später gezwungen in ein Judenhaus an der Seilerstr. 35 zu ziehen, wo ihre Tochter Judis (* 1940) und ihr Sohn Josia (* 1941) geboren wurden. Auch Bettys Mutter Sara zog von Langstadt dort hin. Die ganze Familie wurde am 16. Sseptember 1942 nach Theresienstadt deportiert. Josia starb dort am 7. November 1942 und Judis am 9. Dezember 1942. Sally wurde am 28. September 1944 nach Auschwitz deportiert und zur Zwangsarbeit selektiert. Er überlebte und emigrierte nach dem Krieg nach New York nachdem der Versuch scheiterte, in Eisenbach wieder Fuß zu fassen. Betty war am 4. Oktober 1944 nach Auschwitz deportiert und gleich nach der Ankunft ermordet worden. 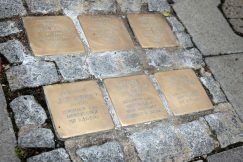 Am Bornwiesenweg in Frankfurt wurden Stolpersteine für Betty und ihre Kinder Judis und Josia verlegt. 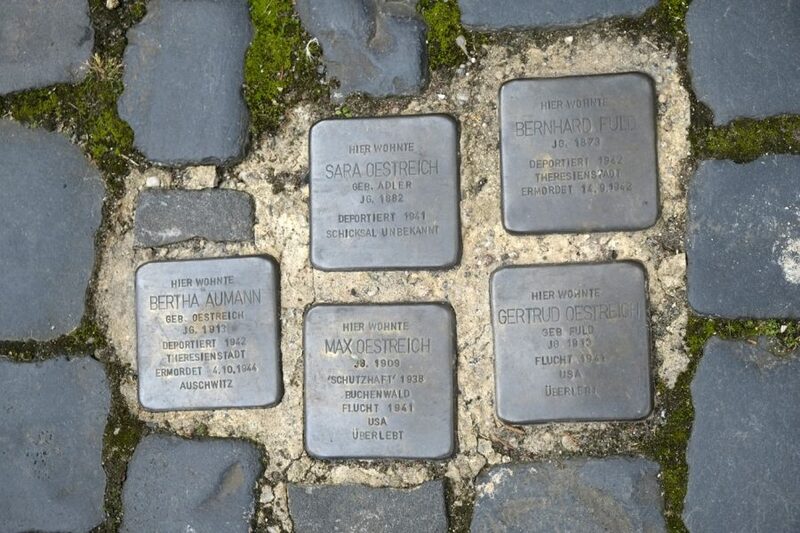 In Langstadt wurden Stolpersteine für Max Oestreich und seine Frau Gertrud, für Betty Aumann, Sara Oestreich und Gertruds Vater Bernhard Fuld verlegt. 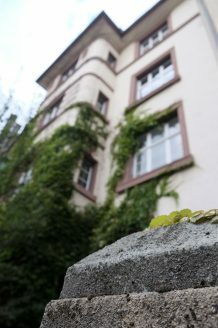 Stolpersteine für die Familie Oestreich in Langstadt.